Under normal circumstances, I try to play it cool. Sure, there’s this guy named Brandon, and I think he’s pretty dreamy and stuff, but most of the time, I try to keep my swooning behind the scenes. Few people look fondly upon public displays of affection—on the Internet or otherwise—and far be it for me, dear reader, to risk spoiling your appetite. But then this guy named Brandon came to town, and one afternoon, he bought me a quarter-pound of culatello. Nothing makes a girl feel prone to public gloating like a present of cured pork from a very handsome vegetarian. And should he then, over the span of ten short days, churn from her kitchen a batch of whole-wheat pita, a bowl of silky-smooth hummus, a vat of fiery hot sauce, ten crisp and custardy cannelés, two lunches’ worth of green papaya salad, rocky road candy with homemade marshmallows, a quart of milk chocolate ice cream with cocoa nibs, a tart and tangy cilantro chutney, a softly sweet tamarind sauce, and the finest chana masala to ever flirt with her lips, she’s bound to start dishing—about the chickpeas, at least. Mine is certainly not the first man to make chana masala, nor does he have any sort of pedigree—ethnic or otherwise—to lend him an air of authority in Indian cookery, but he does have a palate, and a very precise one at that. I may be the more orderly of our twosome, but next to his, my palate is a proverbial bull in a china shop, rubbing clumsily against a rabble of spices. I chew and swallow, but he concentrates, teasing apart tightly woven layers of flavor. So when he starts surveying the spice rack, I set the table, sit down, and watch. All too often, restaurant renditions of chana masala are a show of alchemy gone astray. They pound the tongue with a heavy hand of tomato, smother the taste buds under a slick of oil, or tumble down the throat with a thud, the unfortunate result of unbalanced seasoning. Bold but delicate, Brandon’s version stands as a testament to the fine art of tasting, tweaking, and tasting again. 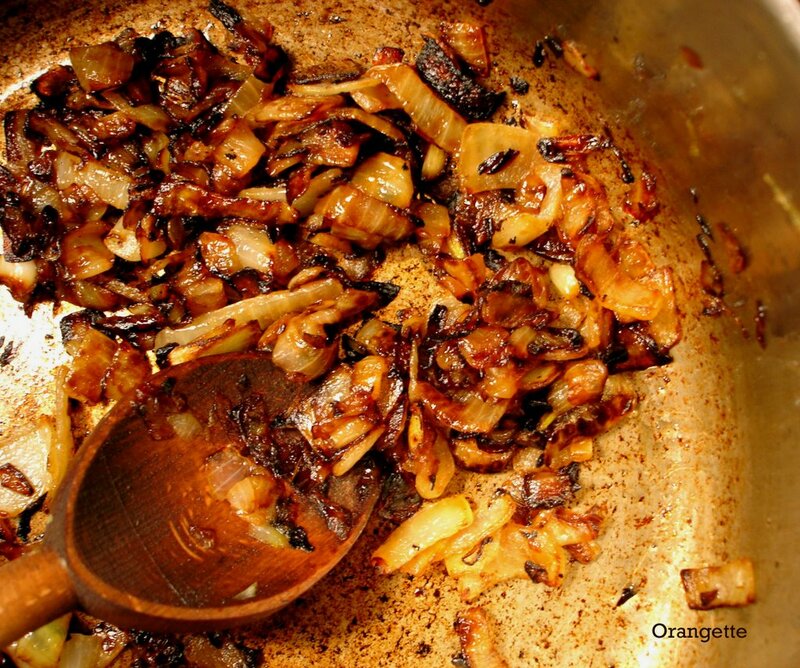 It begins—as many good things do—with a pot of onions on the edge of burnt. Then comes a small but spirited parade of spices, a mess of tomatoes, cilantro, cayenne, and chickpeas, and a few studious spoonfuls for the cook. With a subtle sweetness and a soft rumble of heat, these are chickpeas worthy of a public display of affection—or a post, at least. When I’m not hovering next to him with a pen and paper, Brandon makes his chana masala by feel, tasting and tweaking, stirring and sniffing. The recipe that follows is our joint effort to make his rendition reproducible, and to make it user-friendly for those who love a good, prescriptive recipe, myself included. You should feel free, however, to taste and tweak as you see fit. It’s the Brandon Way. This chana masala can be served in two different styles: with a half-cup of whole-milk yogurt to smooth and soften the flavors, or sans yogurt, served with a squeeze of lemon and a pinch of fresh cilantro. I prefer the former, but Brandon leans toward the latter. Either way, this dish is even better the second—or third—day. I will definitely be trying this recipe. Indian food is die for. It’s all in the spices, isn’t it? Thanks! Ooh, not fair! I’ve met the boy, and I can definitely confirm that he is dreamy. However, the fact that he made all that food for you is just decadence, times two. Ah, but you deserve it. I can’t wait to make this recipe too. Great post! With your class and wit people are bound to smile when you flirt publicly. Thanks to both of you for posting the recipe. Men bearing gifts of food are always welcomed! Dreamy or otherwise! Fab recipe. oh gosh, delicious. i was wondering if you’ve ever supped at rialto’s near green lake? my boyfriend treated me to a birthday dinner there this past sunday and it was DELICIOUS. we could have lived on the bruschetta alone. I’ve been doing more Indian cooking lately, and will be checking the pantry for ingredients for this one. Thanks for sharing it! I am definitely trying this recipe–I love spiced chickpeas– as well as the caneles in mini bundt pan (though I love how French pastries involve so many different molds, I don’t have the space or the money for them all). By the way, I wrote about one of your recipes in my modest little blog– check it out if you get the chance. Could this be the best thing you’ve ever written? I mean, it’s pretty hard to decide because you write beautifully all the time, but something about this post practically made me levitate. And thank you, thank you, for hovering over Brandon with a pen and paper – it is hard work transcribing a gourmet’s wanderings in the kitchen. I can’t wait to try this! That made what’s for dinner tonight easy… thanks to you and Brandon for the recipe.As always, a great piece… who would object to a little swooning once in awhile. 🙂By the way, would you happen to have a recipe for the hot sauce? I could almost smell the spices wafting from my computer monitor as I read your post. Divine! I’m very keen to try this recipe – I’ve been playing at chana masala for a while, now, and am interested in the thoughts and choices of other cooks. And, then, when I come into the comments section, I find a bonus recipe for the hot sauce! Thank you both, Molly & Brandon! Thank you Brandon… fantastic! We only have ‘Flatbreads and Flavors’ at home, I’m guessing you have that as well.I’m thinking that recipe could easily morph by using a different pepper – but then I’m moving into Rick Bayless territory (anchos, guajillos and the like).Are you familiar with Kitchen/Market (Eighth ave and W. 21st)? Good source for bulk dried peppers. They have a display on the right side of the store when you walk in the door, but they’re happy to sell you alot more for alot less. Anyway, thanks Brandon… I’ll let you and Molly know how the chile paste turns out. And I, have the pedigree, but sadly lack the sweet chana masala skills. I’ll be trying the recipe though–this post is fantastic! I’m going to go make this now. It is exactly my sort of thing, and sounds delicious. Thank you. Oh my lately I am on a avocado kick. I must try the two together. Thanks again! Fantastic, Molly. I’m dying to see the recipe for the canelles, though! Can’t wait to try this one over the weekend. I’m going to Kalustyan’s and stocking up on spices!But, um…what’s a canele, exactly? My goodness, can we clone that man? I loved the list of what he prepared. Couldn’t we all use a Brandon, happily cooking away in our kitchens when we came home from work?Thanks for the recipe and the lovely post–I know what I’m making this weekend! Hey Molly,If you crush the cardomom pods don’t you release the little seeds inside? Aren’t they tough little nuggets bordering on inedible?I’ve made a similar concoction long ago and I think I added a dollop of cream. I think your use of whole fat yogurt is similar and probably better. I just found a market that has labne which I’ll probably use (and they have merguez!). hi, loved ur chickpeas. I have the pedigree in terms of ethnicity and loved brandon’s approach to tasting. Every time I taste a new dish, I practically sit there and dissect the flavors. And more often than not, I try and recreate them in my kitchen . Simply love it when I succeed. Chickpeas are my absolute favourites and I make different versions of this simple indian curry depending on the time I have on my hands and how hungry I am feeling. wow, that recipe is total love! looks amazing and it seems like you have the most perfect boy! Man alive. I made the chana masala on Saturday night and it was good, but it was better Sunday and even better today. I have hopes for my last little bit of it that I will eat tonight…I had it beside buckwheat groats with asparagus, mushrooms and lots of crushed red peppers – and some indian spice blend that came with something I bought at the Indian grocery a while back…and a ton of homemade raita. I had stopped cooking Indian food all the time, but I think I’m back. Thanks, ya’ll! Bilbo, that’s a great idea – except that it makes frying and toasting the spices a little awkward. What to do? The quest continues…Aww, kickpleat! Yes, he’s perfect for <>me<>. And that’s plenty good enough, I think.Emmeya, you’re welcome! I’m so glad to hear the chana masala did not disappoint. And with lots of peppers? You and Brandon must have similar taste! Cheers to you, my dear, and to cooking more Indian food. And thank <>you<>, Alanna, for writing back to say how much you enjoyed it! I showed your comment to Brandon, and he’s beaming. Wow–you folks are miracle workers! I just made the chana masala for the first time and my notoriously picky children hoovered theirs right down. I absolutely loved it as well, but *my kids ate it*! AMazing! Got here through random blog-linking, and thought I’d reply, because this sounds quite similar to the way I make channa. I use more garlic/ginger (twice the garlic, at least twice, if not four times the ginger). I also add in some turmeric, to give a slightly bitter taste, and a nice golden color to the sauce. I haven’t tried cardemom in it though, which is interesting — I’ll have to try it out soon. Brandon and Molly,I wasn’t even sure I liked chickpeas, but the spices sounded faboo. Hot damn. This is my new favorite meal. Loved the aromas while cooking and adored the flavors when eating. Thank you! I definitely plan to make this, Indian food and chickpeas being two of my favourite things, but I’d like to know first whether you used green or black cardamom. (I could try making it both ways, but I’m not that patient.) Thanks! Wow. I’ve been following VeganBits and decided to try this on Jane’s recommendation. Thanks so much for your translation of this recipe. I am certainly a touchy-feely cook, and the way you wrote this up allowed me enough of a glimpse into the way Brandon was going about it. I really enjoyed making this dish, and it turned out delicious. Don’t worry, I’ll be back to try others. Molly and Brandon,This recipe is simply. Amazing. I would agree with you that it tastes better the second or third day; however, there was none left after dinner last night, so I will never know for sure.Thanks for sharing this gem — I’ve been looking for a complex (flavor-wise, not preparation-wise) and reliable chana masala for quite some time, and I do believe this is it.And congratulations on the restaurant! Courtney, we buy our garam masala from World Spice, here in Seattle. They blend it themselves. You can order it online, if you’re not local: < HREF="http://www.worldspice.com/blends/0300garammasala-indian.shtml" REL="nofollow">here<>‘s the link. Molly and Brandon, this is fantastic! I’ve had this bookmarked forever, and just got around to making it tonight. It is sublime, truly! This is going onto our regular rotation. Thanks!! Made this for dinner last night based on the recipe in your book and it was really, really tasty! For some reason my version ended up having a lot more liquid than yours/Brandon's (judging by your photo), but it was nice to have some extra sauce to pour over the basmati rice, so that's OK with me. My husband and his co-workers are probably eating the leftovers as I type this (he works on Sundays, unfortunately). I just made this wonderful dish. Superb. Upped the heat a little and fried the onions with some black pepper. Will definitely make again! Love how you guys got to the heart of the dish and used separate spices…not many of us Indians do that these days…I beg my mom for her prepared spices and just bung that at the rest of the ingredients. Or if my stock is low, I happily rely on the pre-prepped store bought mix. :)This is one of my favourite things so we have all kinds of variations on it. It is heaven with a little steamed rice and thin slivers of lemon juice coated raw onion. Or with a giant batura, a lovely fried bread we make..slurrrp.. ok now I gotta go make myself a batch. dearest molly, as i take a quick look at this again to refresh my memory so i can pick up the goods on the way home, i realised i must tell you HOW MUCH I LOVE THIS RECIPE! it's easily about the 20th time i've made it. I'm sorry, I'm sure your husband is an amazing cook in general, but this recipe had WAY too much tomato in it!!! It tasted like tomato pasta sauce with just a hint of Indian flavor thrown in. I've loved your other recipes I've tried though. Way late to the posting, but had to comment, this is amazing, just made it for supper, over basmati rice, perfection in a bowl! You are both amazing cooks, you are my favourite food blog, hands down! Oh, and I got your book for christmas, had to stop reading it in bed though, the urge to cook at midnight was getting to strong to resist!! Yum! Thanks for sharing. As I am on fish/vegetarian diet at the moment I used soy yogurt instead of milk-based. Turned out fine. I just read your book a few weeks ago and loved it! Afterwards, this recipe was at the top of the many that I want to try from it. I made it last night and it was AWESOME! I used ground cardamom, since that's what I had, and a garam masala that I made myself, with I can't remember what, several years ago when I last tried to make Indian food. I forgot the lemon or yogurt at the end…maybe I'll try that with leftovers. Thanks! I loved everything about this recipe but the canned chickpeas, their briny taste just do not appeal, so I used dried chickpeas instead and it turned out fine – except for the tiny difference of taking 4 times as long to cook! the end justifies the means however and I want to say thanks for a wonderfully simple recipe! Made this for dinner last night. My wife enjoyed it so much she had 3.5 servings. Served over basmati rice – perfect touch. Thanks! Lovely recipe. Just a quick tip, cumin seeds are normally the first ones to go into the pan…pretty standard in Indian cooking. From my understanding, this is because of the fragrance that emanates when you let the seeds pop in the oil. I read this post recently and decided to try it out. Molly and Brandon I can't thank you enough for this recipe. It is so perfect for bringing meals to families will new little bundles or if they've caught a bit of a cold or some other ailment. It freezes beautifully and gets better with each day. Making a large batch today in fact. Fresh mango and grated baby carrots along with a good tomato paste give the necessary sweetness to off-set the spice and tart tastes of lemon juice, garam masala, cumin, coriander, curry, anaheim chiles and red chili flakes that I use in my chana. The grated ginger, chopped onions and garlic and ribbons of Thai basil along with cilantro add the final touches to the chickpeas, vegetable broth and coconut milk. Just make sure to heat the spices and herbs with a good quality olive oil to begin. I've made this three times in the last two weeks!! Delicious!! A couple friends of mine (one from India and one from Pakistan) both loved it! Thank you so much for the recipe! I'm new to your blog. This sounds delicious. I've had the pleasure of a mentor for Indian cuisine. She is a young 93 and from Goa. From her I've learned the secret of carmalezing onions for numerous recipes in the way you described. Making the Indian dishes at her side, and then on my own, inspired a later in life enjoyment of cooking through a growing sense of the alchemy underlying the dishes. I look forward to reading more of your blog. Just made this tonight, and it was amazing! Definitely a weekly staple for the rest of the year. Thanks!! This was so delicious! Thank you. 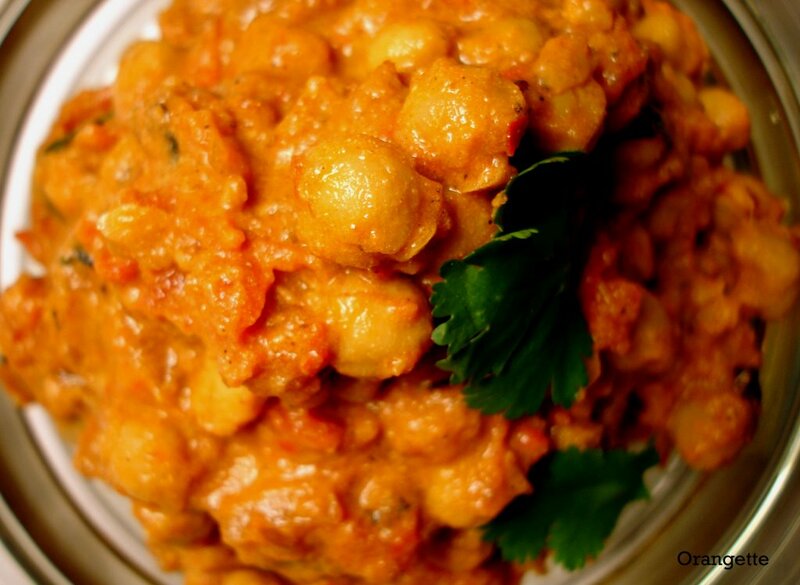 This is one of my favorite recipes to make chole masala. Since I don't know how to make it my mom's way, it is nice to have an alternative when I can't eat her food. Thanks!! Made it today for dinner tonight. Used hot curry paste rather than Garam Masala, ground cardomon, started soaking chick peas yesterday. It is delicious and will be a regular at our house. It leaves a great smell in the house. My wife went out as I was cooking it and she said the aroma was magnificent when she returned home. Ten years later (! ): still worth a thank you. Haven’t been feeling well the past three days, but today I went for a walk and then made your chana masala when I got home. So very glad I did. THANK YOU.